Note: We have PICK UP AND DROP OFF arrangements by appointment in: Ellensburg and Mukilteo area. At Hammond Ashley Studios, we have a community of some of the most accredited and accomplished teachers in the state of Washington. We have ample parking and due to our location; you can avoid the traffic of Issaquah's Front Street. We are located at the corner of 5th Ave NW and Locust, 2 blocks from Safeway, or across the creek from Gilman Village. Easily accessible off Newport Way via Juniper Street. Our teachers offer a diverse range of learning opportunities: Classical, Jazz, Folk, Blues, Rock, Suzuki Method. 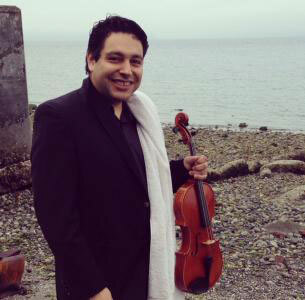 As an active violist and violinist Rafael plays in numerous orchestras and chamber ensembles, including the Northwest Symphony, Rainier Symphony and Seattle Metropolitan Chamber Orchestra. Rafael also works as a Teaching Artist for Seattle Symphony and Arts Corps, offering different music programs throughout the Puget Sound area. Rafael is a violin coach for the Cadet group at Bellevue Youth Symphony Orchestra and he is a string clinician with the Auburn School District. He has worked with all age levels, including preschool, elementary school, junior high, high school and adult. Rafael started his musical studies at Conservatorio de Castella in his native country, Costa Rica. There he earned his high school diploma and an honorable mention in violin performance. As he began his college years, he started teaching Suzuki-based lessons at three music schools in the Costa Rican countryside. After earning a degree in Horticulture from Universidad de Costa Rica in 2000, Rafael then switch to playing viola, studying at the Instituto Nacional de Música and later playing with the Costa Rica National Symphony in 2001. In 2002 he won the Monroe Scholarship at Loyola University New Orleans to study violin and viola. In 2005 due to hurricane Katrina he relocated to Albuquerque, New Mexico where he concluded his undergraduate viola performance degree and then earned his Masters in Music Performance at University of New Mexico. In Albuquerque he was the violin teacher for the El Sistema-based Young Musician Initiative (YMI), conducting group violin lessons for elementary school students. Also, he served as orchestra clinician for middle and high school orchestras and coached string chamber music groups throughout the state. Prior to arrival in the Seattle area, Rafael played with The World Orchestra, New Mexico Philharmonic, Santa Fe Symphony, San Juan Symphony, Ensamble Tarrazú and The World Orchestra Soloists. In his free time, Rafael enjoys spending time with his wife and son, and his puppy and two cats. He also enjoys gardening, traveling and learning to play the harp. Helena Krimsky was born and raised in Finland and started studying music and violin at age six winning her first competition at age eight. At eleven she appeared with Kauhajoki String Orchestra and the following year toured Hungary soloing with them during their two week visit to Europe. Her subsequent appearances included competitions, recitals, concert tours, musical events and festivals. Her teachers include Mariann Hercegh, Zinaida Gilels, Pertti Sutinen, Ann Elliot-Goldschmid, Denes Zsigmondy, and Burkhart Godhoff. In 1995 Helena moved to the US where she has been performing in the Northwest and beyond. She has been soloing with local orchestras and completed a concert tour to Alaska in February 2001 which included teaching master classes at the University of Alaska Anchorage. She has been involved in community outreach projects bringing music to less privileged youth. In August 2008 she performed at the celebration of the 100th anniversary of the Moore Theater as a tribute to Jascha Heifetz. Helena is frequently contracted to record movie soundtracks and music for videogames and has performed with groups such as Queensryche and Bridgeport Saints. She has also released two CDs; Praeludium in 1999 and Legends in 2001. Helena has been a performing member of the Ladies Musical Club since 2000. Presently, Helena teaches private violin lessons in the Seattle - Eastside area. 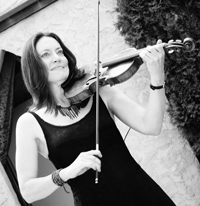 Shelley Weiss is a violinist, violist and fiddler who recently moved to Seattle from Philadelphia. She holds degrees (in viola performance) from the Cleveland Institute of Music and Rutgers University, and also spent two years studying viola at the Hochschule für Musik in Vienna, Austria. She has 17 years private teaching experience and enjoys playing and teaching music of all styles. Rachael began teaching at the University of Michigan, Ann Arbor, where she earned her Master of Music degree as Teaching Assistant to Paul Kantor, one of the world’s most respected pedagogues. She earned her B.M. at Rice University’s Shepherd School of Music with a Full Fellowship under the tutelage of Kathleen Winkler. After her solo orchestral debut at the age of 12, Rachael won many competitions including Ladies Musical Club of Seattle, and was a National Finalist at the MTNA Senior Competition. Awarded a Fellowship to the Aspen Music Festival, Rachael went on to study under and perform with many luminaries of the classical world. She is currently Associate Concertmaster of the North Corner Chamber Orchestra and performs regularly with the Seattle Symphony, Seattle Opera, and the Pacific Northwest Ballet Orchestra. She also enjoys recording movie music, participating in several local Chamber Series, and of course maintaining a private teaching studio. Rachael believes in a fun and joyful approach to music which goes beyond foundational technique to the development of a beautiful sense of musicality and a warm, rich tone. She teaches an integrated Suzuki method influenced by Dorothy Delay and Sally O’Reilly and tailored to her students’ needs. I was born and raised in Russia, where I received most of my musical training in the great tradition of Russian violin school, with its trademark emphasis on solid technique and deep musical expression. I studied at the music college and conservatory in the city of Ekaterinburg, and continued my training in the United States under the guidance of some of the best players and teachers.Since relocating to the United States more than twenty years ago, I have been playing in professional symphony orchestras, including The Florida Orchestra, The Naples Philharmonic, and the Grand Teton Music Festival Orchestra, sharing the stage with artists as diverse as Itzhak Perlman, Pinchas Zukerman, Bobby McFerrin and Herbie Hancock. I frequently perform with the Seattle Symphony Orchestra, Seattle Opera Orchestra, Pacific Northwest Ballet Orchestra, Fifth Avenue Theater Orchestra, Teatro ZinZanni Band, and other ensembles. In addition to classical, I also enjoy playing many other different kinds of music – jazz, tango, klezmer and more, on acoustic or electric violin. I've been a violin and viola teacher for as long as I've been playing professionally. I offer private violin and viola lessons for all ages and skill levels, from beginning to advanced students. I am happy to share my knowledge and joy of music making with anyone who would like to learn, whether you are five or eighty-five. In my teaching I give students a solid technical foundation essential for success, while not forgetting to focus on the sheer joy of playing music, which is the reason for taking music lessons in the first place.One of the main characteristics of my teaching is versatility and flexibility. I am prepared to meet the student on whatever path he or she wishes to take, and guide him/her through it. Custom tailored to each student’s needs, goals and abilities, to ensure the quickest progress. Aimed at developing strong technique, musicality, performance skills, as well as give a general understanding of music theory and music history. Conducted in a relaxed, supportive and positive environment, maintaining the right balance between rigorous practicing and pure fun, enjoyment and excitement of music. Aubrey Burdick is an accomplished violinist who performs solo and chamber music spanning over four hundred years from early baroque to contemporary music. She has performed at the Vancouver, Boston, and Twin Cities Early Music Festivals; with Apple Hill Chamber Music in New Hampshire and the Music from Salem series in New York; and as a performance fellow at Nief-Norf contemporary chamber music festival in Knoxville, TN. As an orchestral musician, she has performed with Cape Ann Symphony, New England Repertory Orchestra, and the International Symphony Orchestra. Ms. Burdick holds a Master’s in violin performance from Longy School of Music where she studied both modern and baroque violin. Her teachers include Sharan Leventhal, Mark Lakirovich, Sophie Vilker, and Dana Maiben. Ms. Burdick is an equally experienced teacher who provides a supportive and patient learning environment of students of all levels. Her teaching style is based on traditional classical technique (Galamian, Flesch, Kodaly, Kato Havas) enhanced by folk and fiddle traditions to emphasize improvisation skills while supporting basic musicianship skills. She teaches note-reading and incorporate ear-training and tonic solfege sight singing into the lessons to encourage playing by ear and sight-reading skills. Students' repertoire is drawn from a variety of genres for a broad musical education and also to tailor to individual interests and goals. 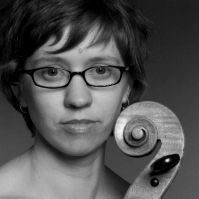 Aubrey Burdick was a 2013 participant in the Starling-Delay Symposium on Violin Pedagogy at Julliard and served on the faculty at the Newton Academy of Music in Newton, MA and the School for Strings in Port Huron, MI. She is a member of American String Teacher’s Association. Marcus Talley has been an active music educator in the Seattle area since 2006. 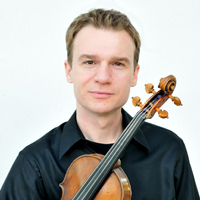 He joined Seattle University as adjunct faculty in 2010 and teaches courses in string pedagogy, string performance, and chamber music in addition to teaching violin. Outside his work at SU, he maintains a large and successful private studio in Issaquah, is a violin coach and coach coordinator for the Everett Youth Symphony Orchestras, and works with string programs in the Northshore school district. 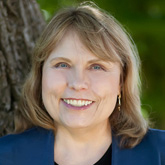 Dr. Talley has worked for the Seattle Conservatory of Music as the director of the Eastside chamber music program, a chamber music coach for the Westside program, and as teacher of the college/performance preparation class. He works as a clinician and adjudicator and has held teaching positions at Interlochen Arts Camp, Seminar Music Camp, and the Suzuki Institute of Seattle. Dr. Talley holds a Doctor of Musical Arts (DMA) in violin performance from Michigan State University, a Masters (MM) in violin performance from Western Michigan University and a Bachelors (BM) in violin performance from Western Washington University. His principal teachers include Charles Avsharian, Renata Knific, David Updegraff, Walter Schwede, and Celia Weiss-Nicks. 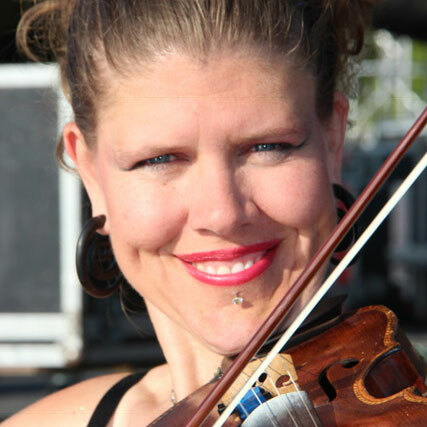 Jennifer Fedie McCrorey began violin lessons at age 4 as part of the Suzuki Talent Education program in Eau Claire, WI. This was her inspiration to study music and become a teacher herself. She holds a Bachelor's degree in Violin Performance with honors from the University of Wisconsin at Madison where she studied violin with Vartan Manoogian, and a Master’s degree in Violin Pedagogy from the University of Texas at Austin where her violin teacher was Eugene Gratovitch. Jennifer was a teacher at the acclaimed Texas String Project under Anne C. Witt where she worked with students of all levels in private and group lessons. Jennifer's teaching and performing career began in Dallas, TX where she performed with several area orchestras including The Chamber Symphony of the Metrocrest, Plano Chamber Orchestra and Richardson Symphony. She taught violin lessons in her own home studio as well as in the Carrolton-Farmer's Branch and Lewisville school districts. From 1999-2005 Jennifer and her husband lived in Madrid, Spain where she was a member of the Orquesta Filarmonia de Espana and was co-founder of the International Violin School of Madrid, a Suzuki violin program made up of Spanish and expatriate students from all over the world. Jennifer has also lived outside of London, England where she maintained a violin studio and performed with the Surrey Mozart Players and the Baroque ensemble, The Cannons Scholars. In 2008, she and her husband settled in Issaquah where they are raising their two young boys. 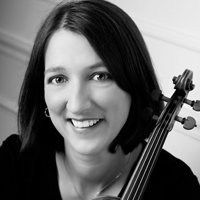 Jennifer is a member of the Suzuki Association of the Americas and the American String Teachers Association. She has attended numerous workshops in Europe and the U.S. covering all aspects of Suzuki and traditional violin pedagogy, as well as historical interpretation and performance. Jennifer is associated with Issaquah Suzuki Strings. Andrea began playing the violin in the public school system at age nine and hasn’t stopped since. She holds a B.M. from Western Michigan University, and a M.M. from Michigan State University, both in violin performance. In grad-school, Andrea was an active member of the Community Music School at Michigan State University, a Suzuki school servicing the greater Lansing area. 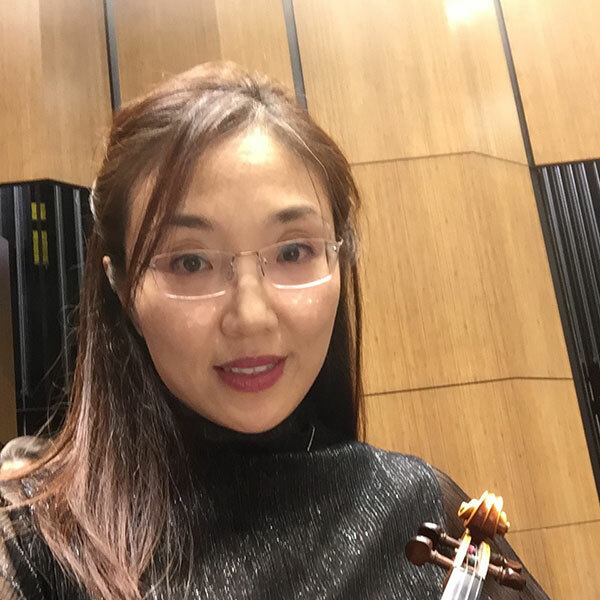 A registered Suzuki violin teacher, Andrea has completed training seminars with Judy Weight Bossuat, Christie Felsing, Martha Shackford, and Ed Sprunger. Andrea has taught as part of the Foothills Suzuki Institute, and most recently, helped to co-create Issaquah Suzuki Strings in 2014 where she currently teaches. 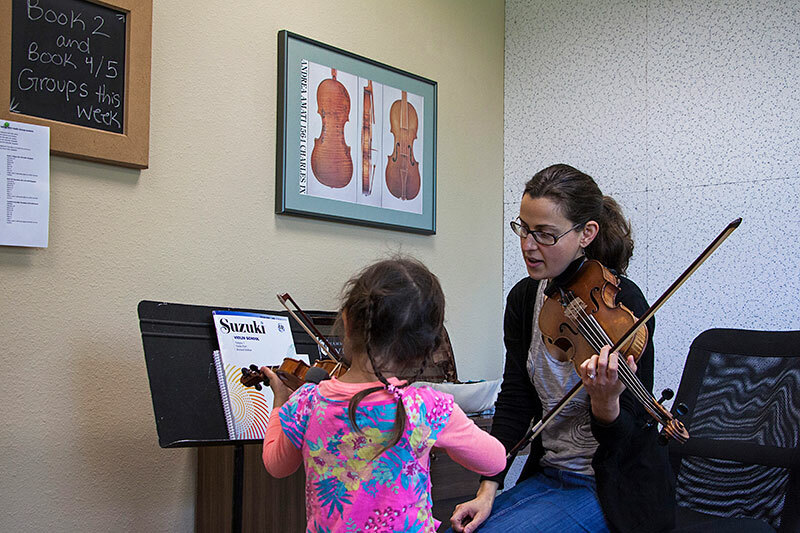 She instructs over 40 young violin students, both private and group lessons, and helps to run Camp Tierra, an annual Suzuki Strings summer camp held at the Tierra Learning Center in Leavenworth, WA. Besides studio teaching, Andrea gets a kick out of conducting student orchestras. She spent 4 years with the Everett Youth Symphony organization as the director of the Prelude String orchestra, and is currently conducting the Overture String group with the Cascade Youth Symphony Organization. 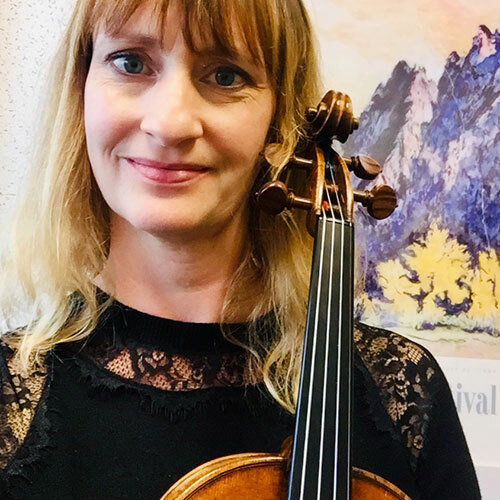 Previously, Andrea has worked as a strings specialist for the Northshore, Edmonds, and Mukilteo School districts, and as a clinician for regional solo and ensemble competitions. She was the primary teacher/developer of a Suzuki strings program for the La Conner School District, and directed the violin program at Immaculate Conception Regional School in Mt. Vernon. As a performer, Andrea has played with the Juneau Symphony, Federal Way Symphony, Bellevue Philharmonic, Skagit Opera Orchestra, and the Lake Washington Symphony. She is also a member of NOCCO, a conductor-less chamber orchestra performing in the Seattle area. 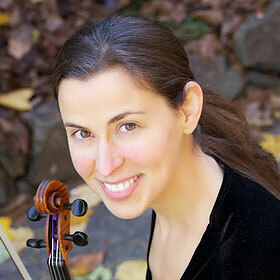 Andrea is the President of the Suzuki Association of Washington State, and a member of the Suzuki Association of America and the American String Teachers Association. When not performing, teaching, or conducting, Andrea enjoys traveling, and hiking the next section of the PCT with her violinist-husband Marcus. Violinist/teacher Jenny Cho has been in high demand as a violinist and teacher since 2002. Having grown up in the Seattle area, Jenny left home to follow her dream at the Cincinnati College Conservatory (CCM), where she enjoyed a busy freelancing career (with the Northern Kentucky Symphony) while balancing her studies and eventually earning her Bachelors of Music in violin performance. Her primary teacher was Dr Won Bin Yim from the Dorothy Delay studio. She also spent her summers at the Aspen Music Festival (1996-2001), playing with the Aspen festival orchestra, participating in master classes and playing chamber music. Following college Jenny performed and freelanced all around the country and world in Hawaii, New York and Seoul. Since moving back to the Seattle area in 2012, she plays with the Yakima, Federal Way and Lake Washington symphonies. She is a Suzuki specialist and teacher with emphasis on foundation. She enjoys teaching all levels of classical violin. Jenny holds 3 student recitals a year and her students play with the Bellevue, Cascade and Seattle youth symphonies, have been prize winners in major student competitions, and have gone on to major and minor in music. Jenny is passionate about helping students realize their potential! Ms. Caulton began studying viola in the 4th grade as part of her public school orchestra program. She went on to win a Conservatory Dean’s Scholarship and complete degrees in music education and viola performance at the Oberlin Conservatory of Music. Teachers included Jeffery Irvine and Lynne Ramsey. While at Oberlin, Ms. Caulton won an Orchestral String Fellowship to the Aspen Music Festival. Her performance experience includes the Aspen Chamber Symphony and the Academy Orchestra of the Collegium Musicum in Pommersfelden, Germany. In addition to her musical training, Ms. Caulton holds a PhD in psychology and is licensed as a school psychologist. She served students in this capacity before taking on her current role as elementary music specialist with the Issaquah School District. Ms. Caulton’s teaching background includes both traditional and Suzuki methods. She is professionally affiliated with the Suzuki Association of the Americas and the National Association for Music Education. Christie Chen began her musical studies of piano at the age of 4, and cello at the age of 9. After graduating as the valedictorian of her class with a double major in cello and piano from the Manhattan School of Music Pre-College studying with Marion Feldman and Elena Billy, she continued her music education in cello and received her bachelor and master degree of music from The Juilliard School under the tutelage of Zara Nelsova “The Queen of the Cello”, legendary cellist Harvey Shapiro, and member of The Juilliard String Quartet Joel Krosnick. She was a doctoral candidate at the State University of New York, SUNY, studying with soloist Colin Carr. 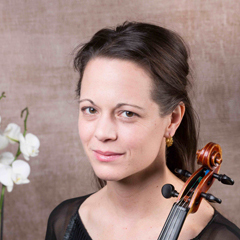 Christie has studied in master classes with Mstislav Rostropovich, Yo-Yo Ma, Janos Starker, and Anner Bylsma. 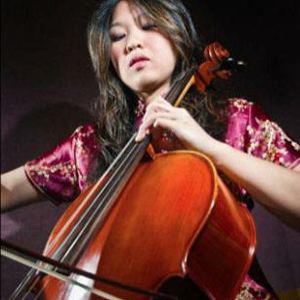 Cellist Christie Chen has appeared as soloist with renowned orchestras including the Manhattan Philharmonic of New York, Union Symphony and Summit Symphony of New Jersey. Christie has appeared in such venues as Lincoln Center’s Avery Fisher Hall, Alice Tully Hall, and Weill Recital Hall at Carnegie Hall. She was featured in the The McGraw-Hill Young Artists Showcase, which was broadcast nationwide on WQXR, the Radio station of the New York Times. An active chamber musician, Christie has been invited to the prestigious Ravinia, Yellow Barn, Kneisel Hall music festivals, and guest principal cellist for the String Orchestra of New York. She has collaborated with the members of the Emerson String Quartet performing the Schubert’s Cello Quintet, as well as the Cleveland, Takacs and Avalon String Quartets, members of the New York Philharmonic, violinist Donald Weilerstein, pianist Leon Fleisher,and cellist David Finkel among others. 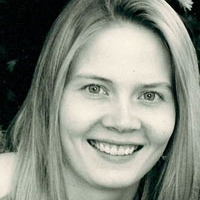 As an active musician and teacher in the Seattle area, Christie has been faculty at the Seattle Conservatory of Music, Seattle University, principal cellist for the Seattle Metropolitan Chamber Orchestra, has collaborated in chamber music concerts with the members of the Seattle Symphony, and has appeared in such venues as Benaroya Hall. 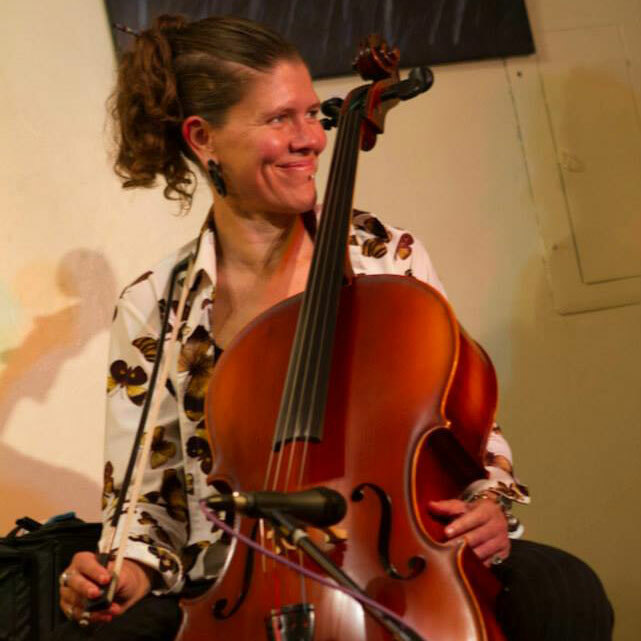 Kim has been teaching cello privately in the Seattle area since 2000 and has recently received pedagogy training in the Suzuki method studying under Barbara Wompner at the Seattle/Japan Suzuki Institute. She has been an intern and coach at Chamber Music Madness for several years under nationally recognized chamber music teacher Karen Iglitzen. Kim has been actively involved in the arts community of the Northwest for over a decade. She is a member of the Northwest Symphony Orchestra, Lyric Opera NW, and Bellevue Opera. She also performs as a freelance musician and is an active chamber music performer in the greater Seattle area. 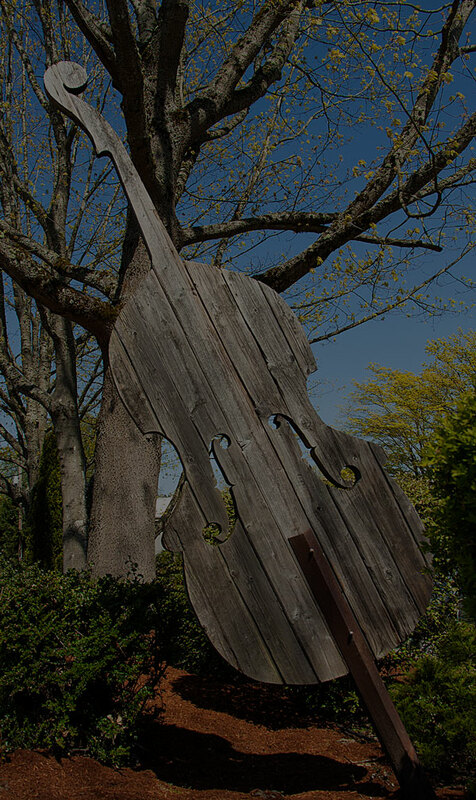 Kim moved to Seattle in 1996 after receiving her BFA from Alfred University in New York and went on to receive her Bachelors of Music in cello performance from Cornish College of the Arts in 2005 where she studied with Paige Stockley Lerner. Kim currently studies with Mr. Walter Gray of the Seattle Symphony. While studying cello performance at Cornish, Kim discovered her interest in composition and was fortunate to study with Janice Giteck and Jarrad Powell. Kim finds ways to combine her visual art background with her music by collaborating with artists of various disciplines through performing and composing. Kims first project, Katrina, is based on a heroic young womans experiences through a mythic world. She combines spoken word and film along with various non-traditional combinations of instruments. The world premier of Quaking Aspens, from Katrina was performed by the Bainbridge Choral in May, 2005. Also in the spring of 2005 the Saint Helens String Quartet performed the first movement of String Quartet No. 1, I. Sunrise. In 2006 Kim composed the score for the short film, R.E.X. by her friend and collaborator W. Jack Strain. Most recently, Kim was commissioned by the Chautauqua Regional Youth Symphony to write a piece for their 20th Anniversary Gala Concert on May 18, 2007. This piece is scheduled to have its Northwest premier with the Northwest Symphony Orchestra in the fall of 2009. 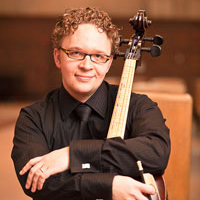 Nathan Whittaker, violoncello, enjoys a unique and diverse career as a concert soloist, chamber musician, recitalist, teacher, and historical cello specialist. He plays regularly with the Seattle Baroque Orchestra, Pacific Baroque Orchestra, Portland Baroque Orchestra, and is a founding member of the Op. 20 String Quartet. Recent concert appearances have included the Indianapolis Early Music Festival, Vancouver Early Music Festival, and Pacific Baroque Festival (Victoria, B.C. ), as well as other concert stops ranging from Seattle to New York to Dubai. He also composed and recorded an original score for the Emmy nominated documentary "When Seattle Invented the Future". He can be heard on recordings by ATMA Musique and Harmonia and broadcasts by NPR, CBC, and KING FM. An active pedagogue, he maintains a dynamic private studio and is faculty at the Cornish College of the Arts and the founder and director of the Seattle Chamber Music Coaching Sessions (SCMCS). Along with his busy performance and teaching schedule, he completed a Doctorate of Musical Arts from the University of Washington in 2012. Dr. Whittaker also holds degrees from Indiana University. Matt Hopper was born and raised in Indiana. He started playing electric bass at age 13, studying mostly rock while in high school. Matt played with a number of different bands in Central Indiana including rock, punk, and R & B bands. Picking up the double bass at age 21, Matt immediately joined a bluegrass band with which he played for over five years in Northern California. In 1997, Matt began studying music formally at Humboldt State University. During the next four years, Matt studied bass with John Brecher and played in a number of ensembles including the Humboldt State Symphony, AM Jazz Big Band, PM Jazz Big Band, Jazz Combos, Vocal Jazz, Percussion Ensemble, and various chamber groups. Matt was principal of the bass section of the HSU Symphony from 2000-2002. He also tutored students in theory and ear training from 1999-2002, and taught at the Sequoia Music Workshop from 2000-2002. Upon graduation, Matt moved to Durango, Colorado where he maintained a private teaching studio and played with the San Juan Symphony, Four Corners Chamber Orchestra, and freelanced with numerous jazz and rock bands. Matt performed with the Jeff Solon Quartet at the Telluride Jazz Festival in 2002 and 2003, as well as being a first call bass player for studio sessions including Jeff Solon, Jeff Sweet, Richard White, Ryan McCurdy, and two records with early country favorites The Brown Brothers. Matt moved to Seattle in 2003, where he plays in numerous jazz groups including Motel 5, New Architects, Card Hopper Smith Trio, and PGM Trio. He also plays traditional Latin and Brazilian music in the Adam Hunter Band, and plays electric bass in The Beautiful Confusion. 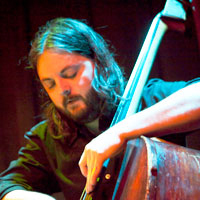 Matt is the principal bassist for the Seattle Rock Orchestra. He has also recorded with a number of local artists including Jean Mann, Wayne Horovitz, and The Beautiful Confusion. 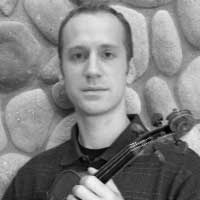 Matt has been teaching privately for over ten years and has worked at Hammond Ashley Violins for more than six years. 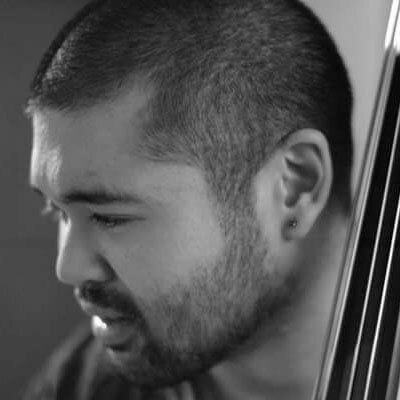 Ramon Salumbides began his studies of the double bass with Barry Lieberman, (former Assistant Principal of the Los Angeles Philharmonic and current Artist in Residence at the University of Washington), and would eventually attend UW for a Bachelor’s Degree in Double Bass Performance. In the summer of 2013, Ramon won the position of Section Bass for the Yakima Symphony Orchestra and has since then been granted tenure. In addition, he currently holds the position of Principal Bass for the Seattle Metropolitan Chamber Orchestra, Seattle Philharmonic String Orchestra, and the Pacifica Chamber Orchestra. In the past Ramon has also played for the Thalia Symphony Orchestra (Principal) and has subbed with the Seattle Symphony, Bremerton Symphony, Seattle Philharmonic Orchestra, and the Maui Pops Orchestra. Ramon has served as double bass coach for the Bellevue Youth Symphony Orchestra, and various schools within the Bellevue, and Lake Washington School Districts since 2013. His current studio ranges in a wide variety ages (9-40), styles, and ability levels. Students have gone on to receive recognition within BYSO, All-State, and acceptance into collegiate music programs. In his free time, Ramon enjoys hiking, mountain biking, snowboarding and whatever else the great outdoors of Washington has to offer. He also enjoys traveling, cooking, and is a huge Barcelona FC supporter. Ramon still plays is a number of bands and is an active member to the Seattle music scene. He currently lives in Renton WA, and spends the rest of his time with his family and friends. "Pete Martin is an impressive multi instrumentalist"
"Pete Martin is a national class mandolin and fiddle player"
1994 National Adult Fiddle Champion, Weiser, Idaho. 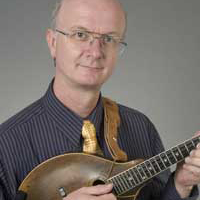 Regular instruction columnist for the national quarterly "Mandolin Magazine"
Aaron Malver began playing piano at two years old, guided by his father. He began formal study at five with Maria Rantapaa and Gena Levinson in Minnesota, and eventually Mary Ann Danenberg at the Oberlin Conservatory. 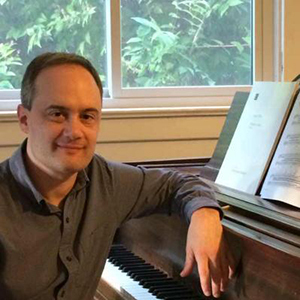 After moving to Seattle, Mr. Malver studied and taught with Jinhwa Chon at the Seattle Piano Academy and earned a Bachelor of Arts degree in Music at the University of Washington under Patricia Michaelian. Beginning at age ten, Mr. Malver also studied the trumpet. His primary instructors were David Bach and Ralph Schwarz, followed by Kenneth Davis (jazz) and Byron Pearson (classical) at the Oberlin Conservatory. He has also received instruction from Manny Laureano and Jon Faddis. He has performed and recorded as a soloist and ensemble member in classical, jazz, musical theater, pop and rock, salsa, and other styles. Mr. Malver is the assistant editor of Perspectives of New Music, the leading academic and professional journal of contemporary music theory. Mr. Malver opened the Studio in 2004 in Seattle’s Wallingford neighborhood, where he also continues to teach piano, trumpet, and music theory. He is a member of the Music Teachers National Association. 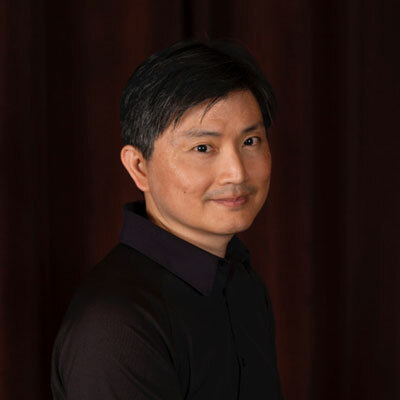 Dr. Jason S. Kuo studied piano with Ms. Martha Wasley at the University of California at Berkeley and was later coached by Ms. Janet Guggenheim, whose worldwide concert credits included over thirty years of collaboration with the celebrated violinist Itzhak Perlman. Dr. Kuo performed in public masterclasses of Richard Goode and the late Karl Schnabel while residing in the San Francisco Bay Area. He has been teaching piano privately since 1991, and has been actively performing as an accompanist and a chamber musician. 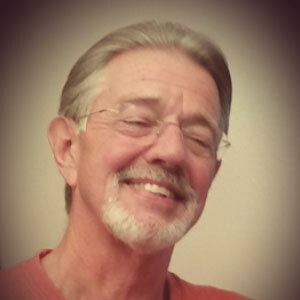 In the Seattle area, he frequently can be seen providing professional accompaniment service to students participating in festivals and competitions. Little Bird Piano Academy is a program for kids from infant to age 5. With this fun and unique method, parents interact with their kids and develop skills and techniques to help their children learn. Piano and voice are used as the foundational instruments used to teach music as a language. Students learn to play in all keys, transpose, improvise, read and write music, and to play by ear. Musical notation, theory, expression and technique are taught through games, songs, and activities. Holly believes that all children can benefit from having full use of the musical language just as they are offered full use of spoken language, and that families are strengthened by learning together. 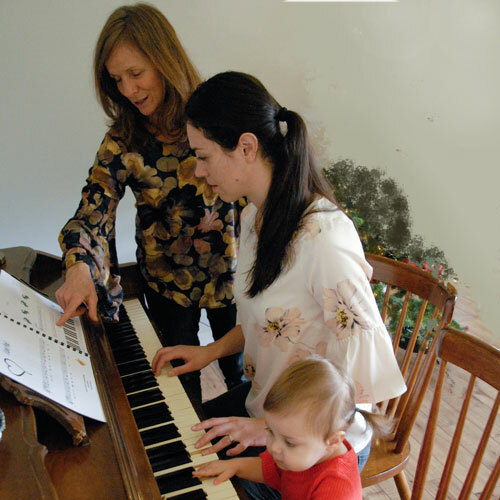 This method was developed and is taught by Holly Hamilton, a lifelong learner and educator with over 40 years of experience teaching piano to small children. Her education includes classical, contemporary, jazz improvisation, and composition for piano and voice. Holly received her pedagogy training through Seattle Pacific University and continues to study commercial music. She is a prolific composer of choral, symphonic, jazz and piano literature. Holly has performed as a lead in two college operas, and has been a professional jazz vocalist and pianist. She has taught piano to students ranging from infants through adults, has led children’s and adult choirs, has accompanied countless choirs, congregations and soloists on piano and organ, and taught composition and musical notation. She is currently offering private individual and group lessons in Issaquah, Washington. Nedra Gaskill has taught singers in the Seattle area for more than 30 years. She works with all ages, all levels and all styles. She is former National Executive Secretary, National Association of Teachers of Singing (NATS) and a member of The Voice Foundation. Her students are constantly performing in all venues-from living rooms and elementary school stages to the 5th Avenue Theatre and Benaroya Hall. Mr. Stewart is a retired Symphony Principal Flutist and Studio Recording Artist featured in albums, movies and television. He has lived, taught and performed in Italy, Japan, Colorado, Los Angeles, Chicago, San Francisco and now has moved to Redondo, Washington. Among Mr. Stewart’s professional experiences, he has been principal flute in several orchestras of note: The Hollywood Bowl Symphony, The Colorado Chamber Orchestra, principal and soloist in the annual Los Angeles Bach Festival, and principal in the Oakland/Modesto Symphony, Santa Monica Symphony, San Gabriel Valley Symphony and Associate Principal in the Pasadena Symphony and Los Angeles Master Chorale and Orchestra. He has performed with Jack Benny, Bob Hope, Maynard Ferguson and other Hollywood notables. He studied with Philip Meyers, Roger Stevens, Julius Baker and William Kincaid. Mr. Stewart has been an Artist in Residence and lecturer at the American Academy of the Arts in Verona, Italy, Occidental College, BIOLA University, Idyllwild Festival, Los Angeles Bach Festival and the University of Redlands. On call for Warner Bros and Fox. © 2017 Hammond Ashley Violins.